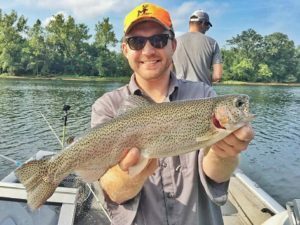 The trout fishing at Lake Taneycomo has been nothing short of spectacular all summer long. On a recent trip in August, Ryan Miloshewski and I, along with our friend Zach Behlmann, absolutely hammered the fish. Although the water wasn’t running Saturday morning, the area just above Monkey Island produced quantities and quality. We caught a 17″ and 20″ rainbow on 3/32oz sculpin/ginger jigs that can be purchased from Lilley’s Landing. Additionally, we caught a larger number at trophy run from the dam to lookout island on 1/8oz sculpin/gingers. In fact, we had numerous doubles and triples over the course of an hour. The fish were healthy and beautiful. Our trip was made possible through one of the local marinas. We simply rented a boat and off we went. It doesn’t take much expertise to figure out how to catch the fish. Some 2 pound test on a spinning rod and jigs from the local marinas are all you need. The retrieve is easy. Jerk the rod tip up and make a 2 or 3 count while you let the jig sink again. Continue that motion as you wind in. Eventually you will start to get a feel for what is enticing the trout to strike. Guides are regularly available, including our friend, Steve Dickey of Anglers Advantage. Visit his website for more info about his trips. 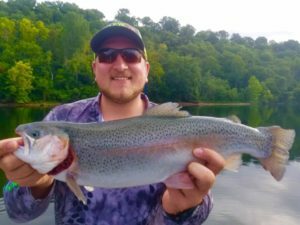 Phil Lilley, the owner and operator of Lilley’s Landing, consistently posts fishing reports that can be found at Ozark Anglers Forum. If you are on social media, be sure to give him a follow on Lilley’s Landing Facebook as well. Every day he posts a video called “One Cast” where he tries to catch a trout on one cast wherever he’s at in the lake. They are very entertaining and informative. Lastly, follow Mahoney Outdoors on social media to stay updated on all the cool products and places we discover! Branson, Brown Trout, Lake Taneycomo, Lilley's Landing, Rainbow Trout, Ryan Miloshewski, Trout Fishing, Tyler Mahoney. Bookmark.